If you want to take care of your oral health for the long haul, one of the best things you can do is come in for a dental checkup and cleaning with us at Young Family & Cosmetic Dentistry every six months. Our compassionate, experienced team members are committed to making even routine visits meaningful for your oral health. These appointments are critical to help you maintain your happy, healthy smile both now and for many years to come. What happens during a dental checkup and cleaning? When you first get into the chair, our friendly, talented hygienists take low-radiation digital X-rays of your mouth. Then, they perform a full cleaning of your teeth using advanced professional tools, removing even the most stubborn plaque buildup and leaving your teeth feeling fresh and clean. Many oral health problems are difficult to spot for the untrained eye. As a result, Dr. Young visually examines your teeth, gums, tongue, cheeks, mouth, and throat for any abnormalities that may indicate an issue, even in its early stages of development. With decades of experience, he provides dental care you can trust. In addition to the thorough visual examination of your mouth, Dr. Young reviews your X-rays to ensure that you have no problems underneath the gumline or between teeth, where it’s more difficult to see. If he does find a problem, he and our dedicated team can provide the necessary treatment to address it quickly and efficiently. Why are these dental checkups so important? Early detection of problems like tooth decay or gum disease is very important because it typically means that your treatment will be less invasive and expensive. If you wait until you notice a problem on your own, it could cause you unnecessary pain or discomfort and require more intensive procedures to resolve. We genuinely care about our patients and do our best to ensure that they leave our office with a clean bill of health. 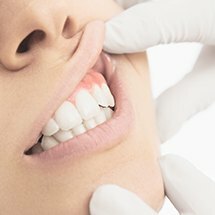 Why are regular dental cleanings so important? We don’t want to simply find and treat existing problems—we want to prevent them from happening in the first place. Even with diligent oral care at home, plaque can build up on your teeth over a period of a few short months. When it does, the bacteria in plaque can cause decay and gum disease. At your dental cleaning twice every year, our team removes any plaque that has accumulated and hardened, especially in hard-to-clean areas, such as between teeth. By performing this cleaning regularly, we essentially wipe the slate clean for your mouth and help stop big problems before they even have a chance to begin developing. Whether you’re new to the area or you just haven’t had a dental appointment in a while, we welcome you to contact us for an appointment. Our team can’t wait to meet with you and help meet your oral health needs.